Sun Mandala Ring. Silver Sun Ring. Antiqued Silver Button Ring. Adjustable Sizing. A detailed Celtic representation of a sun mandala decorates the metal button used in this handmade ring designed with a silver plated ring base that's adjustable from size 7 and up. This handmade button ring is adjustable from size 7 and up, making it comfortable no matter the size of the wearer's fingers as well as ideal for switching from finger to finger. EASTER SALE Native Turtle Ring. Circle of Turtles Ring. Silver Button Ring with Turtle Design. Adjustable Sizing. Handmade Jewelry. 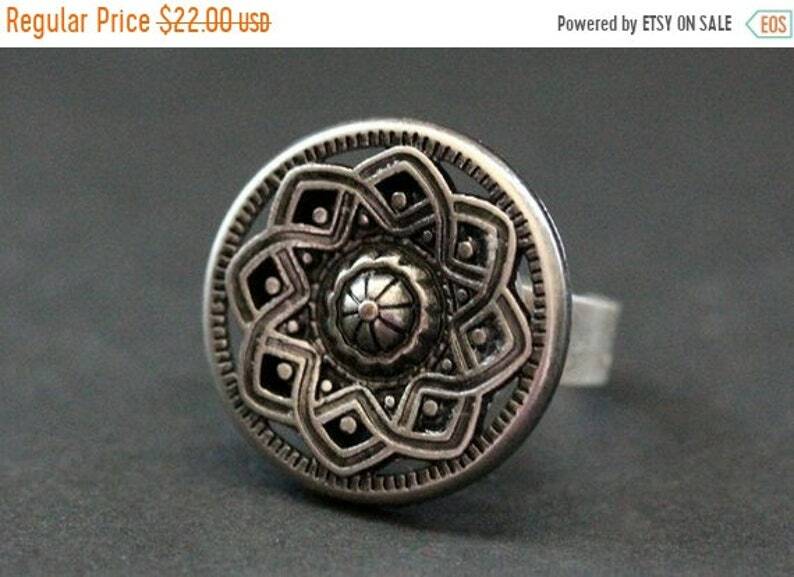 EASTER SALE Mediterranean Mandala Ring. Turquoise and Silver Mandala Ring. Button Ring. Adjustable Ring. Handmade Jewelry. EASTER SALE Spring Mandala Ring. Flower Mandala Ring. Button Ring with Adjustable Ring Base. Handmade Jewelry. EASTER SALE Midnight Mandala Ring. Black and Silver Mandala Ring. Button Ring. Adjustable Ring. Handmade Jewelry.